Drilling fluids, utility locates, tight deadlines. An HDD jobsite is already a complicated place. 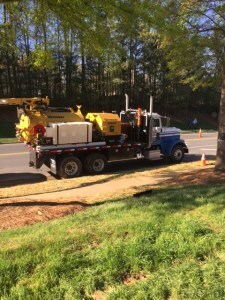 Recently, contractors are finding that getting to and from a project with a vacuum excavator that scales is a challenge in and of itself. Between harsher state and federal regulations, varying spoil weights and a shortage of viable dumping sites, selecting the right vacuum excavator for your specific jobsite needs is more important than ever. Making sure your truck vac will scale — especially when traveling to a dumping site — is crucial to avoiding steep fines that could cripple your profit margins on a project. In many states, law enforcement is tightening its enforcement of regulations and distributing hefty fines for violations (sometimes greater than $10,000!). One of the biggest concerns a contractor has when purchasing a truck vac is the gross vehicle weight rating (GVWR) of the unit. The GVWR includes the mass of the chassis, body, engine, fuel, accessories, driver, passengers and cargo. GVWR is an extremely important factor when selecting a vacuum excavator that will scale since the units are often carrying spoil materials as cargo. Closely tied to GVWR is the issue of finding and hiring commercial licensed drivers. If a vehicle has a GVWR more than 26,000 pounds, a contractor needs to find a laborer with a commercial driver’s license (CDL) to drive and operate that vacuum excavator. Given the growing labor shortage — especially among workers with a CDL — many contractors won’t even consider a vacuum unit that weighs more than 26,000 pounds. The new Vermeer ECO 50 Series by McLaughlin mounted on a Ford F650 chassis features a GVWR of 26,000 pounds, making it a great option for contractors looking to avoid that higher weight rating. If you’re operating a larger-scale vacuum, remember to take into consideration the federal excise tax as well. Vehicles weighing more than 33,000 pounds will be subject to a 12 percent federal tax on the truck and vacuum package unless sold separately. Although implemented in the mid-70s, the federal bridge laws are becoming a greater priority among law enforcement and, in turn, among contractors with heavy equipment. Developed to prevent stress to highway bridges caused by heavy trucks, the federal bridge laws provide a standard to control the spacing of truck axles and how weight is distributed on each of those axles. • A third drop or pusher axle* = 17,000 additional pounds of carrying weight if within 96 inches of another axle. At any given time, a single axle cannot support more than 20,000 pounds of operating weight. With two axles, that amount is degraded to 34,000 axles split among the two. For example, one axle could carry 14,000 pounds and the other 20,000 pounds — or each could carry 17,000 pounds. Adding a third drop axle is an option as well, and can provide up to 17,000 pounds of additional carrying weight, but it should be noted that not all states recognize the third drop axle option. You should consider axle weights prior to mounting a vacuum. Your dealer can help you navigate this process when you are selecting a truck and a vacuum unit to help you save time and money. What makes vacuum excavators more complex than other trucks rolling down the road is how much the weight of the material in the spoil tank can vary. This is really the most important — and most challenging — consideration, because it’s not always consistent and it affects the other two factors. Once you determine your comfortable GVWR and how you will distribute weight across axels, you still need to factor in how your spoil will impact the overall carrying weight of your vacuum unit. Water is the only known factor when it comes to different spoil weights — freshwater always weighs 8.3 pounds per gallon and is the lightest of spoil materials. Other debris can weigh anywhere from 8.3 to 17.4 pounds per gallon, making it difficult to determine how much your vacuum unit will actually weigh when its spoil tank is full. Because of this, it’s usually a good idea to estimate spoil weights before purchasing a vacuum excavator. McLaughlin uses 12 pounds per gallon as an estimate for pothole material and 10 pounds per gallon for HDD drill fluid material. Many vacuum excavators carry spoils that are the equivalent of 40 to 50 percent of their maximum tank capacity. It is important to consider how much freshwater will be carried on the return trip when the spoil tank is full, and how that will affect the vehicle’s carrying weight. For example, a vac with a 2,000-gallon spoil tank may be carrying 800 gallons of freshwater (estimated at 8.3 pounds per gallon), which equates to 6,640 pounds. If the vac is carrying 800 gallons of drilling fluid (estimated at 10 pounds per gallon), it will weigh 8,000 pounds. As a result, the vac’s weight could vary up to 1,360 pounds based solely on the materials in the tank. 1) How would you estimate for spoil weights? 2) On average, how much freshwater will you have on board at the end of the day? This chart from the Association of Equipment Manufacturers outlines the weights of different spoil materials. It can be a helpful resource to discuss with your dealer when shopping for a vacuum. Determine the ground conditions you’ll be working in most frequently and discuss how the weight of that material can vary depending on water ratios. From there, you’ll be able to make a more informed decision about how much your entire vac truck setup, including the chassis, vacuum and spoil tank, will weigh at full capacity. That information should help you select the right vacuum — one that will be powerful enough for the job at hand and that won’t cost you big in fees and penalties. Check back next week, when we will break down three project scenarios and choose the best vacuum excavator choice for the job.